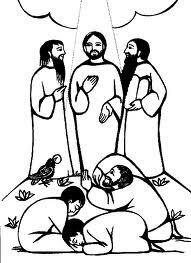 TRANSFIGURATION OF THE LORD. 2ND SUNDAY OF LENT, YEAR C, FEBRUARY 24, 2013. Sinead, Mark and Friends are young adults together. ‘…and from heaven comes the saviour we are waiting for, the Lord Jesus Christ…So then, my dear friends, do not give way but remain faithful in the Lord. I miss you very much, dear friends, you are my joy and my crown.’ (Paul, writing to the young Christian community in the almost abandoned city of Philippi). Do you remember some occasion in your life when ‘the penny dropped’,- some ‘Aha!’ moment, when you saw something or someone in a way you had never seen before- when your eyes were opened for a moment, and you were amazed. 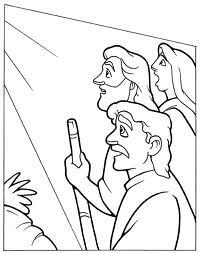 Well, on this Second Sun day of Lent every year, the Church puts before us an ‘Aha!’ moment, when Jesus took three close disciples/friends aside, up on to a high mountain, to pray: and while he was praying, his whole appearance changed for a brief time,- his face was changed, his clothes became brilliantly white, like lightening. And then, at that same moment, two of the great Leaders of the Jewish People, Moses and the prophet Elijah, appeared and were talking to Jesus. An Aha! Moment indeed- Jesus in the middle, brilliantly white and changed, and the two on either side. Simon Peter was gobsmacked. He burst out and said ‘Master, let’s put three tents here, one for each of you!’ He hadn’t a clue what to say! Then there was a sudden shadow over them, and they heard a voice from the cloud saying ‘This is my Son, the Chosen One. Listen to him.’ Just like that! And then Jesus was there alone with them. The moment had passed. Jesus has been ‘transfigured’ before their eyes, for a very short time. And when they came down, they didn’t say a word to anyone about it. And then, a few paragraphs later, Luke tells us that ‘Jesus set his face for Jerusalem’,- he was setting out, he was going only in one direction, and that was towards Jerusalem and all that would happen there, his arrest, his scourging, his handing over to the Romans, his death,- and his rising from the dead! But before he set out, he wanted his disciples (including us) to know who he was and is behind it all,- the ‘Beloved Son’ of the heavenly Father. They needed to have glimpsed this vision of him, before they would later see him hanging like a common criminal from a cross. Hope Lent is going well. Remember the word Lent is related to the German word for Spring. Hope there are things stirring deep in our hearts, these days of preparation for Easter. Encourage one another.